Professor Pettibone, eminent Victorian balloonist, has a problem. He can't get it up. His balloon that is. If he can't reach an altitude of 20,000 feet, and soon, both he and his mysterious travelling companion Hubert Booby will be burned to a cinder by an erupting volcano! But what is Mr. Booby concealing under his overcoat? Instead of a score, you have a reading on the altimeter. This game is mentioned in the prologue for Crimson Detritus (Mystery; 2003; ADRIFT 4). The cover art is presented a little differently in each version. In ADRIFT, the cover art appears in its own window and has the title and author's name in white in the bottom left corner of the basic balloon image. In TADS, the cover art is presented centered in main text window, and is the basic balloon image without text on top of it. The cover art on IFDB and IFWiki has the basic balloon image enclosed in a "Wild West" frame that contains the title and author's name text. To Hell in a Hamper (Jason Guest; 13-Sep-2003; ADRIFT 4). Beta testing by: Ambrosine and Liz Parnell. ADRIFT End Of Year Comp 2003: 1st Place. InsideADRIFT Awards 2003: winner "Best Game", "Best Small Game" and "Most Original Plot/Setting". To Hell in a Hamper (Jason Guest; 17-Mar-2004; TADS 2). Beta testing by: Dan Shiovitz, Phil Swinbank and Tommy Herbert. To Hell in a Hamper (porter: Dave Edwards; 2006; Acorn Electron). To Hell in a Hamper - review from EUG #67, an issue of the online magazine for Electron users, at the Acorn Electron User Group site. To Hell in a Hamper released for Acorn machines - thread on the ADRIFT Forum, started December 27, 2006. Jason didn't know about this port at first, but he sounds supportive as long he can get a copy to play on his Electron emulator. 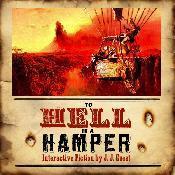 To Hell in a Hamper (archived) - at Baf's Guide. Delron review compilation by various reviewers. Review - by Emily Short for IF-Review. Review - by J. Robinson Wheeler for SPAG. This page was last modified on 29 October 2018, at 13:54.